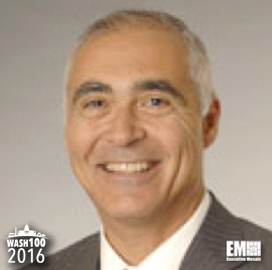 Executive Mosaic is honored to introduce Mitre President and CEO Alfred Grasso as an inductee into the 2016 edition of the Wash100 — Executive Mosaic’s annual selection of influential leaders in the government contracting arena. Grasso has been selected three times to receive the annual Wash100 award. The 30-year Mitre veteran and three-time Wash100 selection elevated to the dual role in 2009 and is in charge of operations at federally-funded research and development centers the nonprofit science and technology organization helps manage. Mitre has been recognized by Computerworld, Aviation Week and Fortune Magazine for its workplace environment during his tenure as CEO. Grasso also currently directs an FFRDC that aims to integrate command, control, communications and intelligence tools into the Defense Department‘s national security programs. Grasso held positions at ARINC Research Corp. and Westinghouse Electric Corp. before he joined Mitre in 1986. He is also a special adviser to the U.S. Strategic Command’s strategic advisory group as well as serves on the Defense Science Board, the Stevens Institute Systems Engineering Research Center Advisory Board and the Northern Virginia Technology Council. Grasso has advocated for science, technology, engineering and mathematics education. Executive Mosaic congratulates Al Grasso and the entire Mitre team for their selection to receive this award. Posted in Wash100 | Tagged Al Grasso, ARINC Research Corp, C3I, CEO, Defense Department, Executive Mosaic, federally funded research and development centers, GovCon, MITRE, STEM education, Wash100, Westinghouse Electric Corp.